A JetBlue flight made an emergency landing at JFK after the plane slammed into a flock of seagulls and one blew a hole in the nose of the aircraft upon takeoff from Westchester Airport Friday morning, authorities said. The FAA said the Airbus A320 bound for West Palm Beach, Fla. with 142 passengers declared an emergency at about 9:30 a.m.
"On departure we hit numerous seagulls, one took a direct hit right on the nose, just below the windshield," the pilot said on air traffic recordings posted by LIVEATC.net. 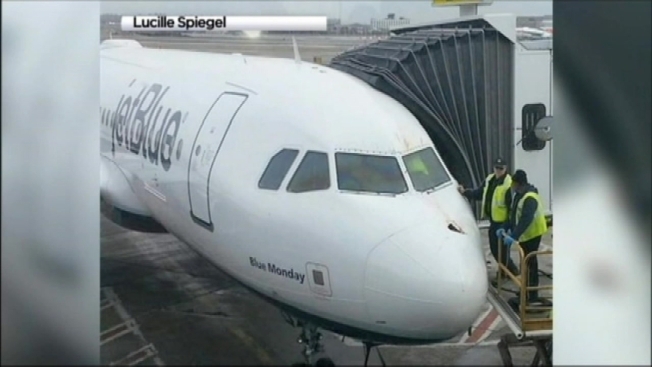 The bird remained stuck in the nose of the plane. "The way I'm looking at it right now, I don't think we can carry on to West Palm, because it does look like we have some damage to the nose here," the pilot said, adding that the damage appeared to be "part of the pressurization capsule." The plane, which took off from the airport in White Plains at 8:53 a.m., landed safely at JFK Airport at 9:55 a.m.
JetBlue said the captain chose to land at JFK "out of an abundance of caution." Customers were given the choice of being taken back to Westchester County or being placed on another flight to West Palm Beach. According to the FAA, Westchester had 22 reported bird strikes in 2013, down from 44 in 2012. This is the first reported bird strike in 2014. Eight of the strikes in 2012 and 2013 involved JetBlue aircraft.